Sometimes a mental link, once established, is hard to shake. When playing a familiar board game with a new expansion, my mind often returns to a friend’s thoughts on the sixth series of the television version of Buffy the Vampire Slayer, which we discussed a few times during its first broadcast. My friend’s argument was that, while flawed in a number of respects, the series represented a radical, engaging piece of television insomuch as it knew and explored its own redundancy. I found myself entirely persuaded by his view. To explain, briefly, in that Buffy dies at the end of Series 5 (sacrificing herself to save the world, as is so often the wont of a heroine), her ressurection in Series 6 can be considered an artificial extension of both her life, and that of her show. The series then goes on to test what happens when the narrative paths of its world and its characters are followed beyond their natural conclusions. Some characters fall apart during the test, ceasing to be credible characters – they become too troubled, too powerful (Willow); some come to mirror the redundancy of the series at large – they’ve already taught us all they could (Xander). But, in its cracks and faults, the series communicates something about the limitations of fiction at large, and serial television in particular. Though expansions for board games are diverse in their scope and nature, they may, at their best, share this quality of self-acknowledging, and experimenting with, their own superfluousness. Whether a game system was designed with expansions in mind, as appears to be the case with the majority of Fantasy Flight’s output, for instance, or whether the expansion squeezes itself into a piece of gamespace it wasn’t intended to occupy (think, for instance, the recent Stone Age expansion, with its clumsy overlay for a section of the original board), the expansion, by nature, should be unnecessary. Barring those unsavoury cases in which an expansion patches a fundamentally flawed original game, there can seldom genuinely be said to be a necessary expansion. An expansion is uninteresting if it does not rebalance: if broadly the same strategy is most likely to win when playing with and without an expansion,then the expansion might as well not be used. And so the expansion tends to confess the artificiality of its game world, inhibiting the mimetic plausibility of the game’s economy, by exposing its contingency. In a cube-pusher, a resource which had been less desirable might be given new purpose; a less used space on the board in a worker placement game might be given additional function. Each admits that the value of the space or resource always was false. This can inhibit immersion in a game played with an expansion. This rebalance frequently comes at too great a price. Often it is said that the best expansions are those which do not add greatly to the length or complication of an existing game. This is probably true, but probably not as informative a statement as it hopes to be. Many of the best expansions may not lengthen a game, but they are not the best for this reason: if, say, an expansion took a game’s play time from one hour to two, but made the game richer and more tense, it would doubtless be celebrated – though this change in length would obviously mean caveats. Instead, I think it is the case that the best expansions test the limits of a game’s existing nature, rebalancing existing elements, rather than reconstituting the game more completely.The best expansions, for me, do not add extra resources or currencies, say, or extra mechanisms. They work with a game’s original character, perhaps exaggerating it, rather than seeking to replace it. It is a secondary fact that this means the game is not often significantly lengthened by such expansions. 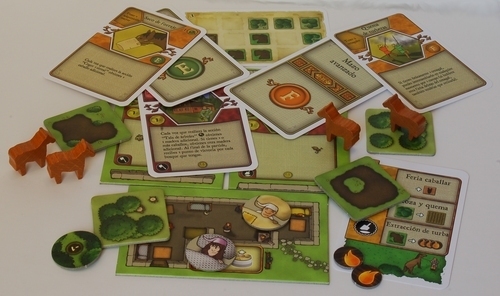 Agricola: Farmers of the Moor is an expansion I personally find awkward, as it debases the fundamental conflict of regular Agricola – that of seeking diversity in spite of poverty: so wealthy and healthy is the farmer of the moor that a good deal of the colour of regular Agricola is washed away. This is largely because its introduction of further currencies (as if Agricola needed them), heat and horses, is achieved by making the whole economy of the game more plentiful. Too many extra actions are available, and the forests and peat which now dot a player’s farm make available too much wood and fuel. Rather, I tend to celebrate expansions which, like the sixth series of Buffy the Vampire Slayer, amplify elements already found in the original. New Ticket to Ride maps tend to succeed in this way. The goal always remains the same – to gain points by connecting cities and completing tickets, but each new map pushes at different of the limits of that structure. 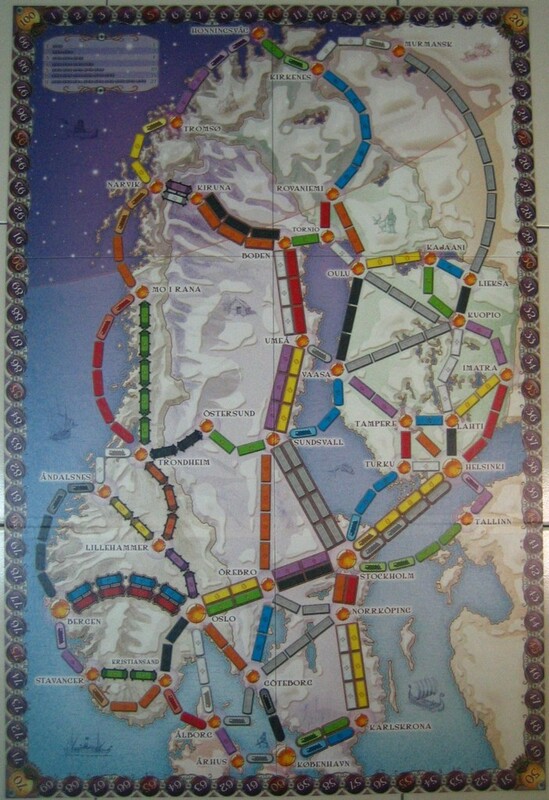 The Nordic Countries map introduces a nine train connection, between Murmansk and Lieksa – longer than any before; Team Asia has cities between which anyone of three possible colours of train cards can be used – more choice than ever before (excepting grey connections, of course). But, in that each game is played with the same deck of train cards as the original game (with the same distribution of colours), the same economic base remains. Many tableau and deck-building games also have expansions which work in this way. The structure of a turn in, say, Dominion, is exactly the same, whether an expansion is used or not. Though an expansion might introduce a new card-type, such as the Duration cards of Seaside, these interface with cards from other sets without any special rules. And, most importantly, both the goal and the fundamental nature of the game remain the same. The player is still trying to gain victory points through bringing order to chaos. Prosperity raises the stakes, testing the limits of what a Dominion card-engine can achieve (and what Dominion as a game can be, as well as what its expansions might be), but it’s still recognizable as the same kind of engine. Thus it is that, in a sense, it is the most redundant expansions which are the most successful. ….And so the expansion tends to confess the artificiality of its game world, inhibiting the mimetic plausibility of the game’s economy, by exposing its contingency. It’s interesting. The best games (Tichu for me is a great example) have such good, simple systems that no expansion is ever needed, or desirable. The rules are simple, but the variation in the 56 cards and the unpredictability of team play mean it’s incredibly replayable. Stone Age, for me, needed an expansion — a new set of rules and commodities to freshen it up after we over-played it. The new rules work pretty well in that they don’t massively change the feel of the game (unlike Settlers expansions). It feels like Turbo Stone Age, which in many ways is quite cool. I think Agricola is somewhere in between — the expansion adds a lot, but there was so much variation in the original game’s cards that it seems unnecessary. The perfect expansion for me is Pandemic — one that polishes up the original game to something really special, including not just its replayability but its components. Although arguably the base game was flawed in that sense.